Gum Disease Could Affect More than Your Teeth and Gums - James B. Howell, D.M.D. If you have periodontal (gum) disease, it's important for you to know its effects aren't limited to your mouth. A number of studies demonstrate gum disease can affect the rest of your body — and what may be going on elsewhere could likewise stimulate gum disease. Here are 3 diseases or conditions that seem to share a link with gum disease. Diabetes. This chronic disease results from the body's inability to interact properly with insulin, the hormone necessary for turning glucose (sugar) into energy, or producing enough of it. There's clear evidence that having diabetes increases your risk of gum disease and vice-versa. If you have diabetes, it's important that you keep it under control for your gum's sake as much as for your overall health. Cardiovascular disease. 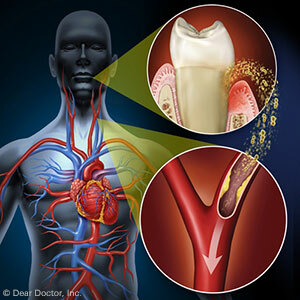 Like diabetes, this group of heart and blood vessel diseases has a related characteristic with gum disease: inflammation. This natural function of the immune system limits tissue damage caused by disease or injury. But in both CVD and gum disease, inflammation can become chronic and itself cause damage. Further, some types of bacteria associated with gum disease can contribute to a higher risk of CVD. Minimizing gum disease occurrence with good oral hygiene could positively impact your risk of CVD. Pregnancy. While certainly not a disease, pregnancy does trigger hormonal changes in the mother that in turn could elevate her risk of gum disease, particularly pregnancy gingivitis. Not only does this pose problems for the mother's teeth and gums, some studies connect gum disease to the increased possibility of early, pre-term birth. A sharper focus on dental care during pregnancy not only benefits the mother but may also be important for the health of the baby. These aren't the only conditions that can be affected by gum disease: others like osteoporosis, respiratory disease or rheumatoid arthritis also share links with the disease. If you have any systemic condition like these, it pays to be extra vigilant in preventing and treating gum disease.